In Ohio, only students are prohibited from using or possessing tobacco products on school grounds. It is up to individual school districts to regulate tobacco use on school grounds by staff and visitors. A 100 percent tobacco-free schools policy – a policy that prohibits smoking or any tobacco use on school grounds and at all school functions – reinforces educational messages about smoking and helps to reduce student tobacco use. Hamilton County Public Health can assist your school district in developing a 100 percent tobacco-free schools policy. There is technical assistance available for policy development, enforcement and compliance. For more information, please send an e-mail or call (513) 946-7926. 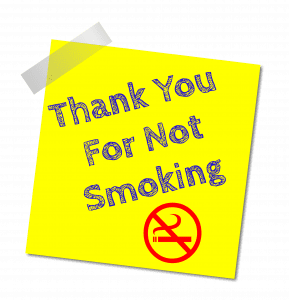 Guidelines for school districts regarding the Ohio Smoke-Free Workplace Law, as well as answers to frequently asked questions.